Keeping the streak alive, I once again wasn't able to participate much in Kids Clothes Week last week. But I did manage to sneak in a bit of time to organize the patterns I want to sew next, and I did actually sew for a couple hours, so I guess I participated a little bit. :) I have been looking through a lot of shorts patterns lately looking for just the right one for an outfit I have in mind. I saw that Dana, of MADE, has a new basic shorts pattern out (and very nicely priced I might add), so I decided to start with this and make a a test pair to see how the fit works and figure out what I might want to modify with the next pair to get to the vision in my head. The pattern does not include the instructions for sewing - those are in free tutorials on her site as there are many variations; you can read more about that on her site. I started sewing the shorts last weekend, and had almost finished them in one sitting, but I got the elastic in and discovered I needed to take off another inch when I tested the fit. Unfortunately I was out of time to sew, so they languished until last night when I fixed up the elastic, sewed up the opening and finished the hem on the legs. Voila, shorts! Done just in time for an evening photo shoot and my daughter asking if she can please wear them right away - of course sweet girl (as my heart swells - totally love that she gets so excited about the things I make for her). I used French seams for the outer leg seams and sewed a piece of ribbon inside the back for her to be able to differentiate front from back. 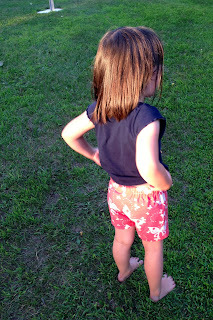 I was looking at pictures this weekend and saw the shorts--crabbing night!